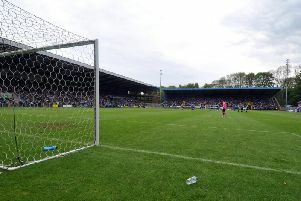 Kingsley James’ late equaliser rescued a point for FC Halifax Town as they drew 2-2 with Lincoln City at The Shay in a game they deserved to win. Town will feel hard done-by after an encouraging performance, but especially considering the nature of City’s second goal, which came from a dreadful error by ex-Lincoln defender Hamza Bencherif. Liam Hearn took advantage to score after goals in the first-half from Lincoln’s Craig Stanley and Town’s Shaun Tuton, who netted his tenth of the season. Halifax had enough chances to win the game never mind get a draw, and were the better side in an entertaining contest. But they at least maintained Jim Harvey’s unbeaten run at Town boss thanks to James’ rasping drive as the hosts’ unrelenting late pressure finally paid off. Jim Harvey stuck with the same team that started their impressive win over Wrexham on Monday, with the same front-two, Jordan Burrow and Tuton, starting in a similarly menacing vein. Tuton was as industrious as ever, while Burrow produced some good hold-up play that deserved better than the subsequent attacks petering out. Lincoln’s only effort prior to Stanley’s goal was Matt Rhead’s shot that was lucky not to clear the South Stand. But after debutant Patrick Brough’s cross was cleared only as far as Stanley just inside the box, the midfielder lashed the ball past Sam Johnson as Halifax conceded for the first time in four hours of football. Former Town man Jack Muldoon, who looked Lincoln’s biggest threat rather than the imposing Matt Rhead, perhaps should have added a second soon afterwards but blazed over after a delightful back-heel to him by Alan Power. But whereas Town under Darren Kelly might have crumbled at this stage, the team under Harvey are made of sterner stuff and equalised when Sam Walker’s clever cut-back from the left was turned in by Tuton courtesy of a deflection which lifted the shot over the diving Paul Farman. Nicky Wroe sent a low shot across goal and inches wide as Town took heart from their goal as Lincoln had from theirs. Kevin Roberts’ drilled shot whistled just wide of the far pots before Walker’s shot was uncomfortably saved by Farman. Halifax were imaginative in attack, with some quick passing and neat interplay offering encouragement of more goals to come. Tuton bustled his way onto Wroe’s deft through ball just after the restart, but claims for a penalty were waved away despite him appearing to be bundled over by Lee Beevers. The visitors were then penned in their box but managed to scramble cross after across away before nearly slicing a clearance into their own net. Matty Brown’s header had been saved by Farman from the resulting corner, and the defender had another effort go off target soon afterwards after meeting Scott McManu’s flighted free-kick. Muldoon continued to be Lincoln’s sole threat and sent a low shot narrowly wide after charging into the Town box. But the hosts looked likelier to score, and nearly did so when Tuton cut in from left before shooting just shy of the near post. Two substitutions in five minutes suggested Lincoln felt the greater need for a Plan B, but it was by accident rather than design that they retook the lead against the run of play. Bencherif had his head in his hands before Hearn found the net as his back-pass let in the striker one-on-one with Sam Johnson before he dribbled round the keeper before tapping in. The timing could hardly have been better for Lincoln, who were on the ropes and had only stayed level moments earlier thanks to Callum Howe’s superb clearance from Connor Hughes’ cross, which looked to be heading straight in. Bencherif nearly atoned for his error but nodded narrowly wide from a corner before Wroe spurned a glorious chance to level but shot off target after some excellent approach play. Brown’s goal-bound shot was blocked, James’ shot squirmed through the six-yard box without a definitive touch before Burrow headed wide. What more did they have to do? Thankfully, not too much as James finished with aplomb after the ball fell to him on the edge of the box following yet another goalmouth scramble. Halifax: Johnson, Roberts (Macdonald 72), Bolton, Brown, Bencherif, McManus, Tuton, Wroe, James, Walker (Hughes 66), Burrow. Subs not used: Porter, Hibbs, Clappison. Lincoln: Farman, Wood, Howe, Beevers, Tempest (Hearn 65), Muldoon, Stanley, Power, Brough, Rhead, Hawkridge (Robinson 60). Subs not used: Grant, Bush, Sparrow.